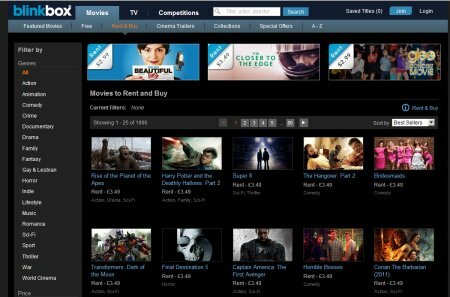 Rent or buy films legally over the Internet at low prices, with online movie firm Blinkbox. Details of what’s on offer from this UK movie service. The days of trekking out to the local Blockbusters to rent a DVD are over. As long as you have an Internet connection, you can watch recent film releases online, legally, with one of the many UK streaming services. TV services such as Sky, Virgin and BT Vision offer on-demand video services, and there are also services such as LoveFilm and Netflix that offer online movie rentals without the wait. Blinkbox is a similar service, the nice touch being that you can view some movies for free, and you don’t have to get yourself tied into regular monthly fees to use the service. Blinkbox offers over 10,000 movies and TV show to watch on-demand, or download to keep on your PC. Movies cost from as little as 99p to watch, or from £3.99 to own. This makes their offering a better deal than many of the movie DVD rental services out there. There’s also a selection of free movies available, although don’t expect to find many great movies in the free category! Watching movies and TV shows is quick and easy … No wait time, and no need to install special software. Go to www.blinkbox.com and try a free film of TV show to see how easy it is to watch their streaming content! Blinkbox also offers a decent selection of TV shows – some are free! At the time of writing, we found free episodes of Peep Show, Andromeda, Highlander, League of Gentleman, Robocop, Shameless and even that little plasticine chap, Morph (what a dude). Given that some of their content is free – if you’re OK to watch a short ad first, then it is a good choice and well worth a try. As I’m typing this, I’m watching series 4 of Chuck, the US nerd spy drama/comedy. Video playback is smooth, ordering the series was easy (and cheaper than the DVD), and for me, an electronic online version is more convenient than a DVD, especially for watching on my netbook. You can use a PC, Mac or a Sony Playstation 3 to watch Blinkbox content, and apparently more platforms are promised soon. Blinkbox does have some catching up to do, as rival streaming movie services such as LoveFilm and Netflix (now available in the UK) support a wider range of devices such as X-Box, Wii, smartphones and tablet devices. We’ve been pretty impressed with what Blinkbox has to offer, and it’s nice to be able to access online content without the need to sign up to a regular monthly fee to watch content. There’s also a decent amount of freebies on offer, so if you’re bored but not want to fork out cash to watch something, there’s always something to watch. If nothing else, do yourself a favour – hop to www.blinkbox.com now and watch a free TV show – if you enjoy the experience, and are fine watching stuff on a computer as opposed to a telly, try a movie. As with any online video streaming service, remember that watching video online will eat into your broadband usage – you should ideally be on an unlimited data plan to avoid extra charges from your Internet Provider. Got any thoughts about Blinkbox or online streaming? Please get in touch! Lovefilm and Netflix UK – Rivals to the Blinkbox service.